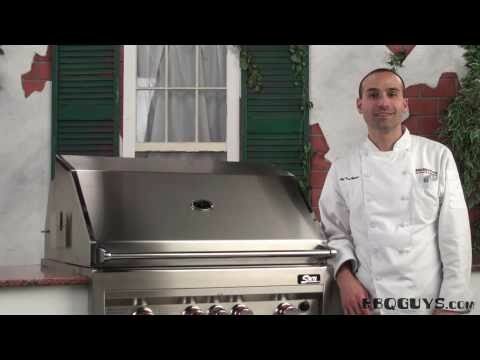 Sunstone gas grills provide the complete professional solution for outdoor kitchen builders at an affordable price. Be the envy of your neighborhood with Sunstone full line of outdoor kitchen and bbq island components. This Sunstone Grill natural gas grill features fully welded, 304 grade stainless steel construction which offers increased durability compared to other spot welded grills. The double walled hood has beautifully polished accents for a stylish and modern look that will seamlessly integrate into any outdoor living space. Three heavy duty, 11 gauge stainless steel burners (up to 60000 BTUs), 3/8 inch professional grade rod style stainless steel cooking grates, and stainless steel flavor zone flame tamer work in conjunction to provide a commercial quality cooking experience with minimal hassle and flare ups. Stainless steel flame directors create temperature zones that will help you achieve truly professional results. Cook your veggies over low heat right next to where you are searing your steaks, with minimal temperature carry over. The 15000 BTU infrared rotisserie back burner includes spit, motor, meat forks, and counterweight. Sunstone come standard with an electronic ignition system, two interior lights to make grilling at night a breeze, wind deflector to keep your control system from over heating during use in windy conditions, stainless smoker box for that desirable smoked flavor, warming rack for keeping buns and veggies warm while the rest of your meal cooks, and roll along drip tray for easy removal and cleaning. Sunstone features and limited lifetime warranty make them the a perfect choice for your outdoor kitchen. Gas hose not included. Cooking Grid Dimensions 25 3/8 X 19 1/16"
Angled hood design looks sleek; burners have plenty of power; good line of outdoor accessories; awesome warranty. Like many other premium gas grills, Sunstone builds with 304 stainless steel and welds the body of the grill for increased durability. The hood is doubled lined for additional protection against discoloration and its angled front has a sleek look. Sunstone didn’t clutter up the control panel with a lot of useless knobs or wording which is a nice touch. The burners are made with 11 gauge, commercial-quality stainless steel and they can handle very high temperatures with ease. This grill has plenty of power, whether you’re grilling steaks or a lot of hamburgers. Sunstone grills also include interior halogen lights for evening grilling and a smoker box. They also offer an optional rotisserie kit and infrared rotisserie burner. Sunstone also back their grills up with an excellent warranty. The burners, cooking grates, and grill housing are covered by a lifetime warranty. Most of the reputable gas grill brands have lifetime warranties so you don’t have to question the quality of the product. Sunstone also builds a full line of outdoor kitchen components and accessories so your outdoor kitchen will match with the same style. While Sunstone builds grills from quality materials, they don’t offer innovative features that set them apart from others. For example, even a somewhat common feature like infrared burners isn't available as an option. The stainless steel flame tamers don’t excel at spreading the heat around evenly, and there are hot spots on the grill. As with most stainless steel burners, they are designed to get super hot and therefore don’t excel when cooking at lower temperatures. There have also been issues with flare-ups. The stainless flame tamers have a “w-shape” and grease tends to collect in the bottom of the tamers where it’s easily ignited by the burners. When cooking on this grill, I recommend watching your food closely. 25 3/8 X 19 1/16" 24 1/2 X 19 15/16" 24 X 19 1/4" 26 1/4 X 22"
25" 24 7/8" 34" 28 1/2"
21 3/4" 23 5/8" 24 5/16" 22 3/4"
10 7/8" 10 1/2" 36" 10 1/8"